Mikrotik Port Fowarding - Port Fowarding is one of the features of the mikrotik router (RB450g, RB750g, RB1100Ahx and other mikrotik router series). 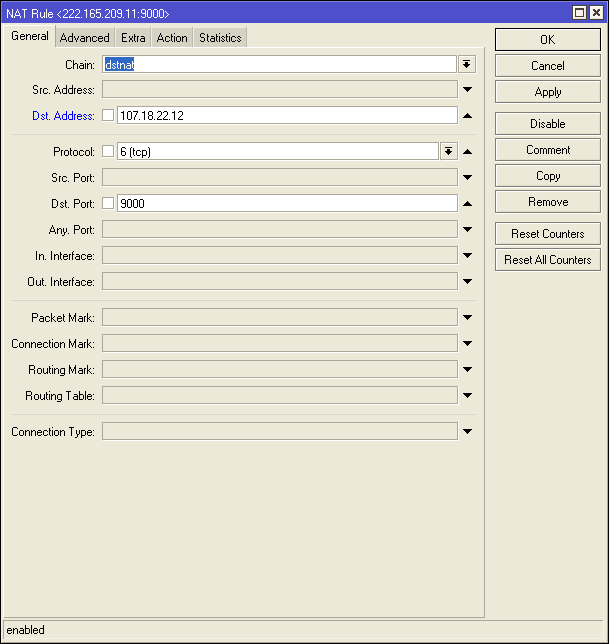 Port Fowarding on mikrotik router is used to redirects from destination address (external ip address/ ip WAN Public) to source address ( internal ip address / IP LAN) based on port number. This technique is most often used to make a host (such us web server, ftp server, ssh server, personal pc and other network devices) that is on the internal network can be accessed via the external network (the Internet) and protected without going through a dial-up VPN or other type of vpn. Standart ports web server is TCP 80 (http) and 443 (https). Many network devices can be accessed via web based by using port TCP 80 and other port, for example cctv, ip camera, dvr, and other. This example will show you how to foward port web server (tcp 9000) to destination NAT. 107.18.22.12 is the example WAN IP address and 192.168.100.1 is the desired internal destination ip address. Dst. Port = 9000 / you can change it. 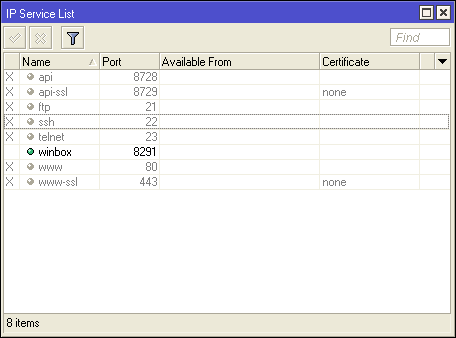 Mikrotik Port Fowarding FTP Server, SSH Server, Mail Server, RDP (Remote Desktop Protocol), and RTSP (Real Time Streaming Protocol). 0 Response to "Mikrotik Port Fowarding Tutorial"